We would see our first button on the far left, the second on the far right, and the third in the middle like so. If the numbering seems a little arbitrary to you then you may not be alone since these methods were deprecated. 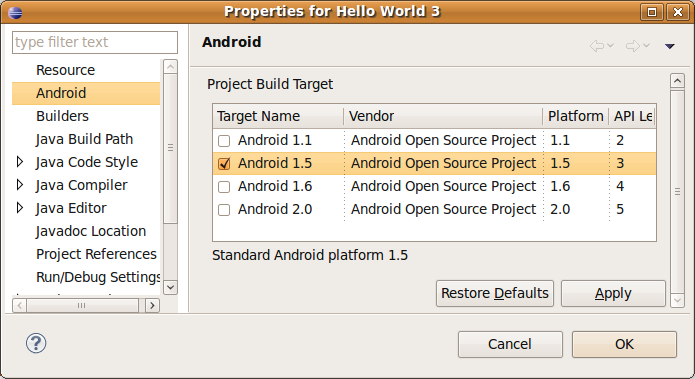 Let’s build this code using a more recent Android SDK. Right click on your project, and click on Properties. Click on Android, and click on the check mark next to either Android 1.5, Android 1.6, or Android 2.0. Then click Apply, and then OK.
You can see that the new method for adding buttons is to call one single method (setButton) and pass a constant telling Android how to render it. Posted by Sheridan on Wednesday, November 25, 2009, at 10:54 pm. Filed under Beginner. Tagged android 1.1, android 1.5, Beginner. Follow any responses to this post with its comments RSS feed. You can post a comment or trackback from your blog. Thanks for this helpful tutorial !!! I tried this example but this won’t render a toast message, is anything else required here? I really like this tutorial set. You have a very engaging style.